LONDON – According to a report released today, the fees for financial advice are set to undergo a process of evolution as HNW clients opt to move away from charges calculated based on their asset levels, towards fixed fee structures. This finding is drawn from Recalibrating value in wealth, the fourth and final report in the 2015 Futurewealth series by NPG Wealth Management, SEI and Scorpio Partnership. The research is based on the views of 3,113 investors from around the world with an average net worth of USD2.7 million and explores all aspects of the relationship management model. This final paper explores the interplay between value and relationship management within the wealth management model. In Europe, 33% of HNWs currently pay a percentage fee based on the assets under advice (33% for UK HNWs) but just 29% would like to pay this way in the future (31% for UK HNWs). Similarly, the usage of transactional charges looks set to drop from 16% of European HNWs now (UK: 16%) to 13% in the future (UK: 13%). 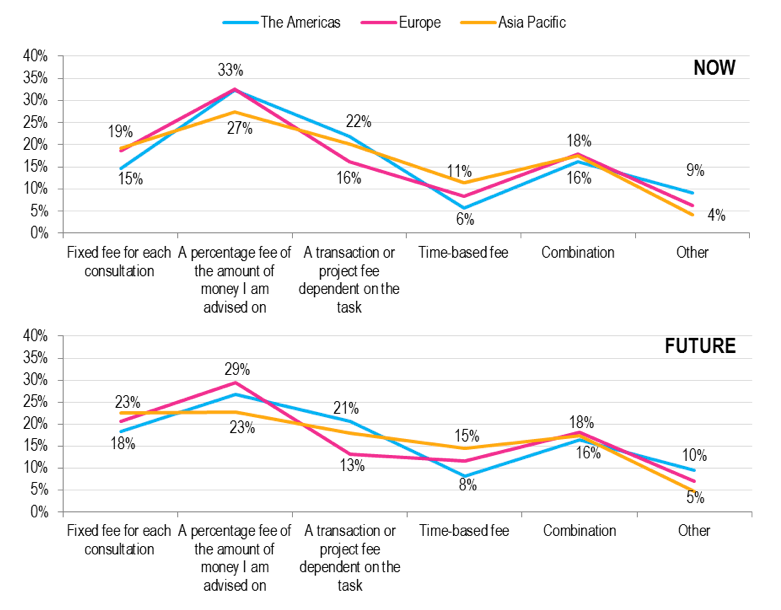 By contrast, fixed fees look set to rise in popularity from 19% of European Futurewealthy (UK: 20%) now to 21% going forward (UK: 23%) and time-based fees will experience a similar increase from 8% to 12% (UK: 8% to 11%). “The traditional ‘percentage of assets’ model means that the client is effectively compensating their financial provider for the value they bring to the relationship, rather than the value they receive. Understandably, they want more control and transparency by engaging with fee structures that more closely reflect their engagement with their financial provider” commented Sebastian Dovey, Managing Partner of Scorpio Partnership. The most pronounced shift in fee formats will be seen among the world’s UHNWs, who are demanding radically different payment structures. While almost a third of multi-millionaires worth more than USD10 million compensate their wealth management firms using percentage fee for the assets they are advised on, just 20% would like to continue using this structure in the future. At the same time, the proportion paying with fixed fees is set to rise from a fifth of UHNW individuals now, to 32% going forward. As well as shifting out of asset-based fees, the UHNW Futurewealthy also want to move away from models that require them to pay for every transaction they undertake. Indeed, while 25% currently pay on a transactional basis, just 18% want to continue to use this methodology. By contrast, time-based fees are set to become more popular with almost 10% of ultra-wealthy investors wanting to pay this way in the future. “There is a strong sense from the research that the world’s UHNWs are questioning whether the fees they pay are in line with the service they receive from their wealth advisors. Clearly, many of them think they should be getting more value by using different payment structures” added Marc Stevens, CEO of NPG Wealth Management. While 75% of the Futurewealthy (UK: 74%) feel that their firm offers good value for money, this rises to 85% (UK: 79%) among the most highly engaged clients (those with over 75% of their assets with the firm). Almost all of the world’s HNWIs (UK: 95%) who rated their satisfaction with their wealth management firm as ‘very good’ said they received value for money. But, just 11% of clients who gave a ‘poor’ rating felt the same (UK: 11%). When asked to allocate the fee they pay for advisory services to different parts of their wealth experience, investors from the Americas focus overwhelmingly on the relationship manager. Of their total fee, investors from this market would allocate almost two-fifths to their key contact. While the relationship manager also gets the largest fee allocation in Europe and Asia Pacific (32% and 28% respectively), the Futurewealthy from these markets spread their investment slightly more across multiple other areas of interaction with a firm such as supporting technologies, product specialists and support staff. HNWIs from the UK would allocate 30% of their fee to their relationship manager compared to just 23% to the firm. Specialists would be given 17% of the fee while supporting technologies would be allocated 16%. 1. In total, 3,113 individuals took part in this fifth global poll of the Futurewealthy. The average level of wealth among these individuals was USD2.7 million. 2. Geographically, 36% of the sample group live in Asia Pacific, 46% live in the Americas and 17% live in Europe. 4. The research was conducted using an online survey. Participants were identified using profiling techniques to determine their likelihood of qualifying as Futurewealthy candidates. They were contacted directly by email. 5. The research was conducted by Scorpio Partnership in collaboration with NPG Wealth Management, and SEI. 6. Scorpio Partnership is a pioneer in the art of translating the complex needs of wealthy clients into practical, innovative and profitable solutions to target these customers. This award-winning firm has developed client insight from thousands of millionaires and billionaires around the world. With this knowledge, the firm has implemented strategic research, practical consulting and business innovation projects in over 35 countries. 8. SEI (NASDAQ:SEIC) is a leading global provider of investment processing, investment management, and investment operations solutions that help corporations, financial institutions, financial advisors, and ultra-high-net-worth families create and manage wealth. As of September 30, 2015, through its subsidiaries and partnerships in which the company has a significant interest, SEI manages or administers $638 billion in mutual fund and pooled or separately managed assets, including $245 billion in assets under management and $393 billion in client assets under administration. For more information, visit seic.com.